Revenue Use: Unseen but recorded on a revenue. Background: *George Elliot migrated to Australia in the late 1840’s with his two brothers Frederick and James. In 1859 they took over the Edward Youngman’s wholesale druggists and dry salting business. They expanded into the production of a range of drugs and chemicals as well as the importation and sale of surgical instruments. In 1873 their venture became the private company Elliot Bothers Limited and this became a public company in 1885. In 1884 George’s son James was recalled from studies in Chemistry and Chemical Engineering in London and Germany to join Elliot Brothers. He designed their laboratories in Rozelle and after the death of his elder brother George in 1912 he became Chairman and Managing Director of the company. James died in 1928 having been predeceased by his two sons and as a result the company was absorbed into a new company called the Drug Houses of Australia Ltd.
Drug Houses of Australia Ltd. (DHA) also saw the amalgamation of several proprietary medicine companies, including Felton Grimwade & Co. and Duerdin & Sainsbury Ltd. Later, in 1974, after significant financial losses the company was broken up. Several parts of the company became Felton Grimwade & Bickford Pty Ltd.
Device: The EBLTD device was most likely a single head type as multiples show no consistent relationship between pattern strikes and approval for its use was sought and approved in February 1898. A similar device is found used at Elliott Brothers office in Sydney and this is found on revenue stamps of NSW, albeit this usage is rare. This Sydney device is known to have been made by Slopers and given the similarity of the patterns it is likely that the Brisbane device was also made by Slopers. The Brisbane EBLTD pattern is found used on postage stamps from 1900 until 1913. Background: *William Philip Dunlop (Snr) came to Sydney from Scotland in 1861 and worked as a salesman in the paper firm of Alexander Cowan & Co. Ltd. William returned to Edinburgh in about 1867 and founded a partnership with George Murray. He then returned to Sydney and traded as a paper merchant, as Murray, Dunlop & Co. In about 1873 he joined with Law Stationer and Bookseller, Frederick Edwards to form Edwards, Dunlop & Co.
William encouraged his brother John Dunlop to come to NSW to join the company and in 1879 he emigrated to Australia with his family, including his wife Margaret and his two sons, James Matthew Dunlop born on 15 April 1867 and his younger brother, William Philip Dunlop born 23 October 1877, both in Edinburgh, Scotland. When they completed their schooling both James and William (Jnr) also joined the company. In May 1886 the company became a public company as Edwards, Dunlop & Co. Ltd. of Sydney and London. In the 1880’s they also opened a branch in Brisbane. Edwards managed the London buying office while William (Snr) and John managed the Sydney sales and distribution. John died in 1912 and James became Chairman and Managing Director of the Australian operations with William (Jnr) as Vice-Chairman. The company prospered despite a disastrous fire in 1906 and supply shortages caused by World War I. They later opened branches in Melbourne in 1920 and Perth in 1937-38. James died in 1949 and William (Jnr) became Chairman and Managing Director. William (Jnr) had taken a lead role in the growth of the company. In about 1944 the company acquired the manufacturing stationer, Galwey & Co. Pty Ltd, and this lead to further expansion of the company in Australia, New Zealand and Papua New Guinea. William (Jnr) died in 1954. Edwards Dunlop came to be the dominant supplier of papers of all forms in Australia and is still trading. Device: The ED device was introduced into service in Brisbane in 1904. An identical device was also used in Sydney from approximately 1905-1906 but usage of this device is restricted to the postage stamps of NSW. Revenue use of these ED devices is limited to Queensland use. The ED device was a single die device. No application is known for the Sydney usage but the Brisbane application and approval in known from October 1907. This is not unusual as in some instances Applications post dated first use. 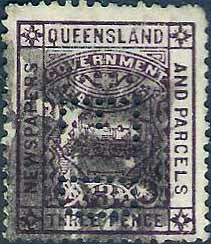 The Brisbane ED pattern is found on postage stamps of Queensland and Commonwealth issues from 1904 to 1940. It is also found on Railway Stamps of Queensland. Edward Dunlop was printed in the lower cartouche of Railway stamps as a further deterrent to theft. 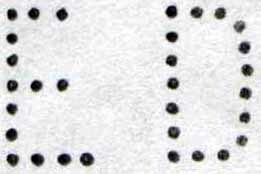 The E and D are fairly regular and read true so it is difficult to determine positions as positions 1 and 7, 4 and 8, 3 and 5 and 2 and 6 can look very alike. 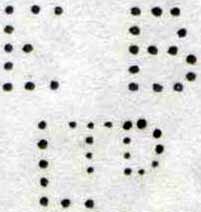 From about 1910 there is a consistent missing pin in the top (perhaps bottom) right hand corner of the E. The device deteriorates further and by the late 1930's there are many missing pins in both the E and the D. This deterioration likely lead to the devices being discontinued in 1940.